Five blue boxes in the upper left are the relays for cartridge type selection and muting. Two black boxes are the MC transformers. The amplification circuit containing two 12AX7 is arranged in the lower half of the printed circuit board. The printed circuit board upper right part is a high-voltage stabilized power supply for amplification circuits. The central right part is a stabilized power supply for heater and logic circuits. The lower right part is logic ICs for relay control. Model4 consists of following parts. 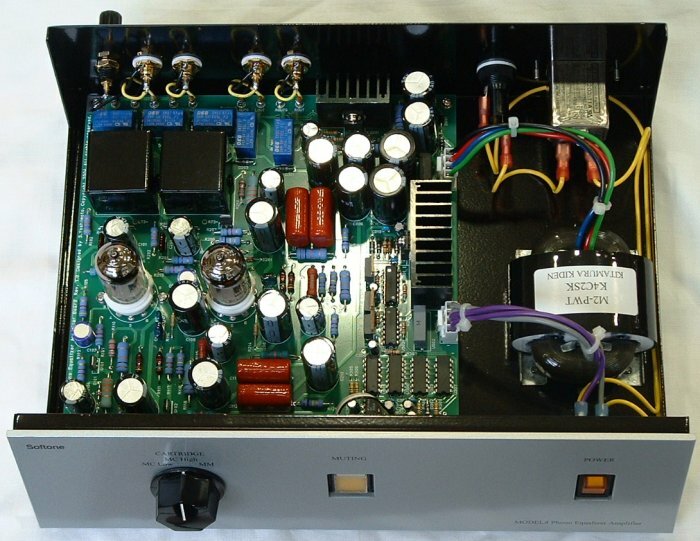 CR type equalizer amplifier using a non-feedback amplification unit. Relay control circuit for cartridge type selection and muting. Almost all parts are mounted in one printed circuit board. 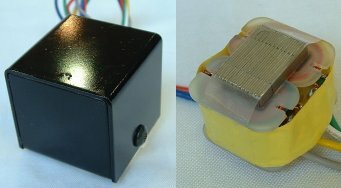 The MC transformer was newly developed for Model4. A wide frequency characteristic and high magnetic noise exclusion capability are acquired by 78% permalloy L type core, and balanced winding structure. There is 2 sets of 10-ohm winding in a primary of the transformer. Primary impedance will be set to 40 ohms if 2 sets of winding is connected in series. When in-series, a voltage ratio is set to 1 to 12, and is suitable for DENON DL-103 etc. Primary impedance will be set to 10 ohms if 2 sets of winding is connected in parallel. When parallel, a voltage ratio is set to 1 to 24, and is suitable for ortofon SPU etc. The change of parallel and in-series connection is performed by the relays arranged near the transformer. Thereby, the shortest signal pass is realized. Equalizer amplifier is constituted by two non-feedback amplification units and CR equalizer element placed among them. The non-feedback amplification unit which consists of the voltage amplification stage by 12AX7 vacuum tube and MOS-FET source follower has realized high amplification ratio, and low output impedance and good distortion characteristic. The combination of a non-feedback and CR type equalizer has realized gentle and delicate sound quality. The low output impedance of the source follower by MOS-FET drives CR equalizer element correctly. And the high input impedance of the source follower by MOS-FET reduced the load of the voltage amplification stage by 12AX7, and has obtained the high amplification ratio. The non-feedback amplification unit has the simple distortion characteristic. By canceling out the distortion between 2 sets of the units, the low distortion has been obtained as the whole equalizer amplifier. It is a direct connection circuit from input to output end. The coupling capacitor is only one place of an output end in spite of a vacuum tube multistage amplifier. Degradation of the sound quality by a coupling capacitor is suppressed to the minimum. The severe multi-stage power supply circuit realizes low noise. The power supply circuit has been independent by the right-and-left channel, and, thereby, a cross talk is reduced. Furthermore, the power supply of the first stage 12AX7 is specially stabilized by the zener diode. Model4 has a control circuit for performing muting and cartridge selection operation. If the cartridge type selection is changed, it will once be in a state to muting, and an output will be intercepted. The muting state is canceled after changing to the circuit which suited the cartridge type. A cartridge type can be changed with non-noise. And there is also no generating of the loud noise by unprepared change of a cartridge type. The control circuit consists of standard logic ICs. Although it is a circuit where a one-chip microcomputer is usually used, it dislikes that a high-speed CPU clock exists in the equalizer amplifier handling a low level signal, and the control circuit consists of a standard logic IC and a super-low-speed clock (1Hz). Muting at the power supply ON. A noise is prevented until a circuit is stabilized at the power supply ON. Muting at the time of the power supply OFF. An output is intercepted at the muting button ON. Circuit change at the cartridge type selection. Muting at the cartridge type selection. Model4 has 300V power supply for equalizer amplifier circuits, 6.3V power supply for heater of 12AX7, and 5V power supply for control circuits. Any power supply is stabilized. High quality parts are used for Model4. Low noise vacuum tube. Glass epoxy circuit board. Large-sized resistor. Large-sized film capacitor. High precision capacitor. Quality tube socket. Gold plated RCA jacks.